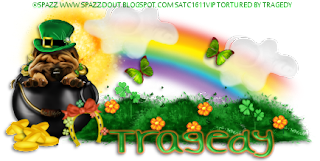 Tragedy's Creationz: Wish You Were Here tut.. Satin Dreams tube by Zindy. Get it HERE. Touch Of your Lips tube by Zindy. Get it HERE. Wish You Were Here kit by Jackie's Jewels. Get it HERE. Select the inside of the frame with your magic wand. C/P Touch Of Your lips tube. Change the layer property to overlay. Hit delete on your keyborad. Change the layer property to soft light. Dropshadow tube, Mask, & Frame. Using the Chubby Cheeks font in all caps type out Wish You at the top of the frame using #1c5e6b. Apply Gradient Glow of 5 in color #c2af97. Using the 2 Peas Fancy Free Font in color #c2af97 type out Were Here. Apply Gradient Glow of 5 in color #1c5e6b. Use your deform tool to position over the left side of the frame. Position with the bottom of the clock over the bottom of the stems. Position over the bottom right of the clock. Use your deform tool to position over the bottom left of the basket. Position over the bottom right of the letter. Position over the left of the letter. Position between ink and notebook.